I’m hugely passionate about flexible and freelance working. I started notonthehighstreet.com when Harry was just three months old, so my workload had to exist around my life and family. Luckily for me, I was able to follow my dream of creating my own business whilst being a new mum – and I’m not saying it was easy! But it was hugely rewarding. For many new mums, working in this way is not an option. There are hundreds of thousands of incredibly skilled, talented women (and men!) out there, who will go above and beyond for work and projects that can fit around their families. It seems incredulous to me that businesses aren’t waking up to this yet. To try and help turn the tables, I recently became an ambassador for Digital Mums, as part of their #WorkThatWorks and #CleanUpTheFWord campaigns. ‘Flexible working’ seems to sometimes feel as if you are giving less than perhaps a permanent member of staff, or maybe it’s just the negative stigmas attached to it. #WorkThatWorks is strong and positive, and just by saying those words, you’re reminded of something we all forget from time to time; work should ‘work’ within your life. I just love the whole concept and hope it helps to really change the landscape for mums. Included in these new jobs are the thousands of makers, creators and small business owners that I’ve championed, mentored and worked with over the last 15 years. I created Holly & Co to be a destination for this remarkable group, to find colourful advice, inspiration and support. Because I know that this path can sometimes be a bit difficult and lonely, it’s my mission to unite these amazing individuals, because I believe that we’re stronger together. I feel so ecstatic about the prospect of a more freelance world, and all of the talent, colour and uniqueness it will bring. I can’t wait to see more people take a deep breath, be brave, and live their own ‘Good Life’! Bring on 2020! 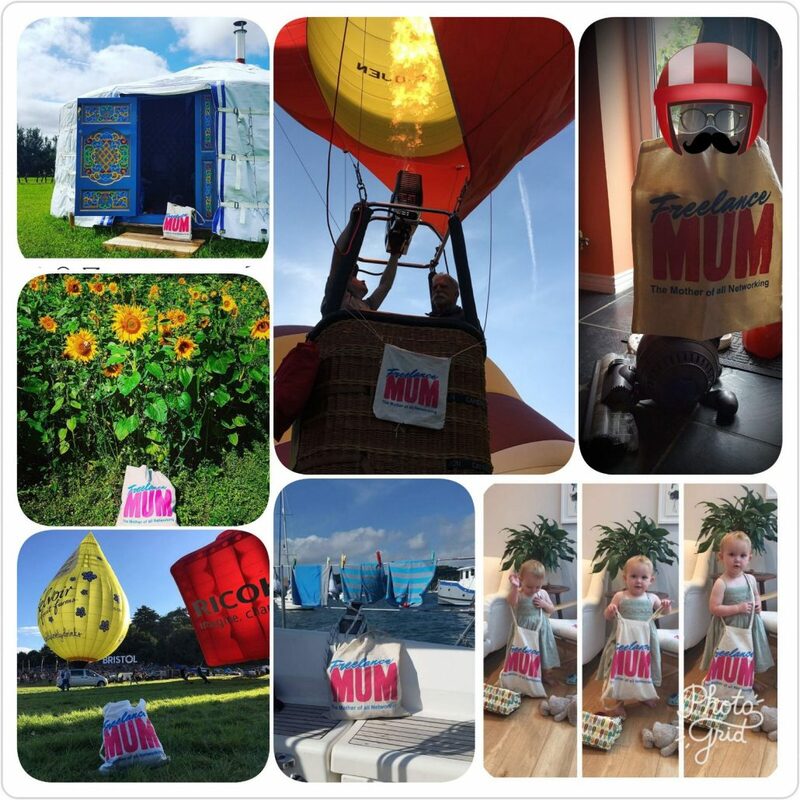 In many ways, summer holidays are no different to any other day, as a freelance mum. Holidays are no different to any other day, as a freelance mum. It’s all a juggling act, just in different guises. Yet with summer, comes greater expectation and lets face it, we all want to enjoy time off. As a freelancer and a mum, that’s never easy. Which is why I thought I’d take the time, take stock and share some of my reflections on and things I have learnt this summer as life as a freelance mum. 1 – Having time away, a complete change of scene and a large dollop of daydreams really is good for the soul. It’s also good for making things happen. I’ve always known this, but it was reinforced this holiday when we were in Devon. To quote Freelance Mum member and hypnotherapist, Abi Rogers ‘a change of scenery is essential!’. Believe it or not, our brains are actually more productive when we’re not concentrating on the task in hand – hence those ‘eureka’ moments at random times’. Brilliant excuse for more holidays’! 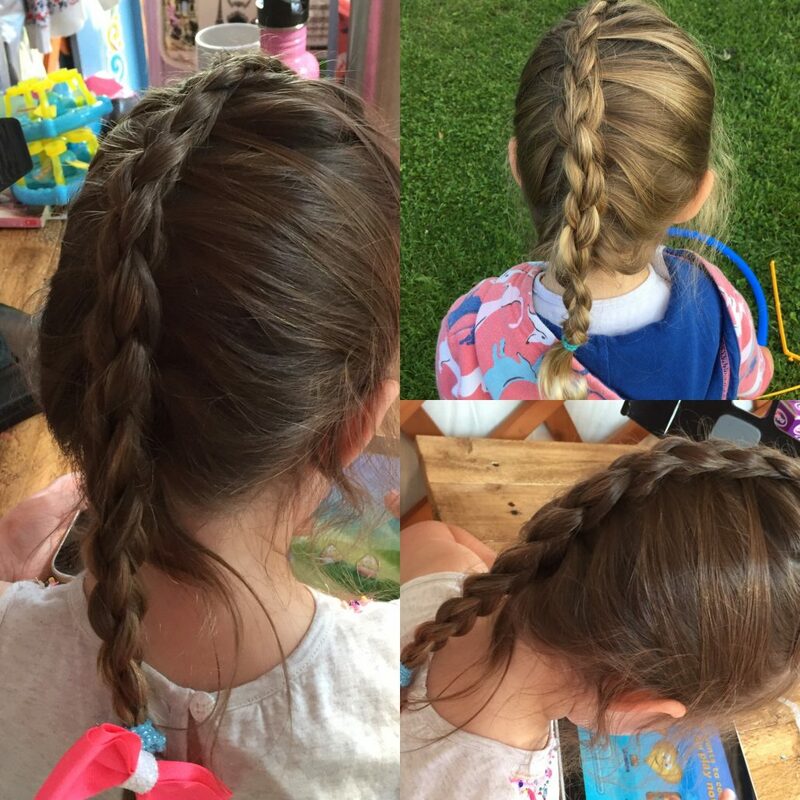 On one particularly wet afternoon on holiday in Devon, I decided to master different type of plait. Not much of a life skill, but I like being creative and I’m rubbish at following tutorials. So I was pretty impressed I managed to watch one enough times to actually manage something that vaguely resembled a plait. It’s nicknamed a dinosaur plait, as it looks a bit like the spine of a dinosaur, it’s official name is a ‘4 strand, 3D plait’, which sounds far more impressive. The most impressive part being, I can now just about do one, while Suki is watching Peppa Pig. Jemima, however, is having none of it – though I may have tried out the odd one, without her realizing. I’m not saying I’ve mastered it, or even that Canva and I will ever be best friends, but we’re now on speaking terms. We have fallen out several times previously, but with a bit of training from Karen Norman from Sensible Marketing, Canva and I are now friends. Together we can be creative and make nice pictures. Sometimes we still get cross with each other, but we’re getting on a whole lot better than before. 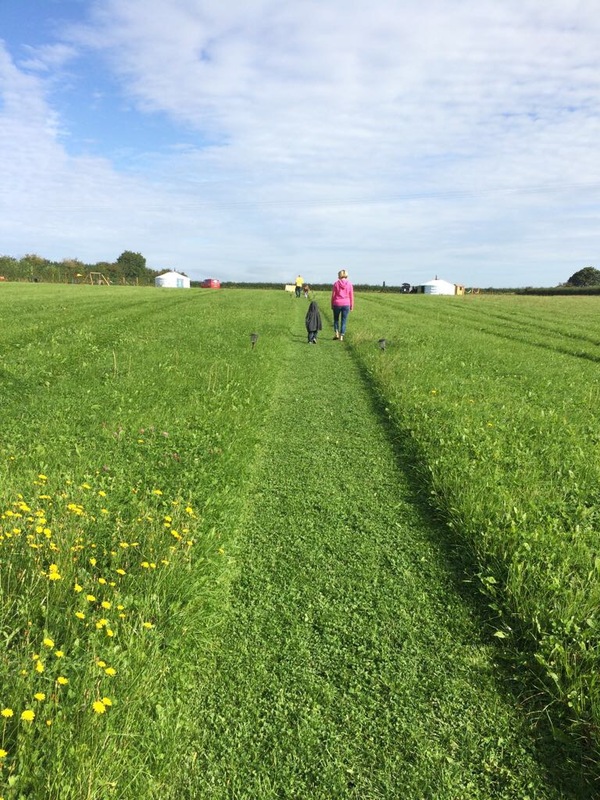 One of the things I enjoy about August, is because there’s no Freelance Mum events in August, I have time to look at the bigger picture – not just the day-to-day running. A chance to look at the year ahead and not feel like I’m fire fighting, it’s a really good place to be and a great way to get a sense of the year ahead. On good advice from Linda Davies Carr, The Maser fixer and Rin Hamburgh, I decided to run a summer offer – book a podcast before September 30th for £150. Simple and streamlined. Not to mention the Freelance Mum Tote Bag Photo Competition, great suggestion from Nicky, of Nicola Jane Photography. Think ‘Hello’ magazine style, with photos of the Freelance Mum Tote Bag, in various locations, work/home/holiday. A fun way of generating content and makes people smile. You don’t have to be doing anything special, they just like being together. I was reminded that this week, while Suki had a nap and I suggested to Jemima, we pop into the studio and do some work. 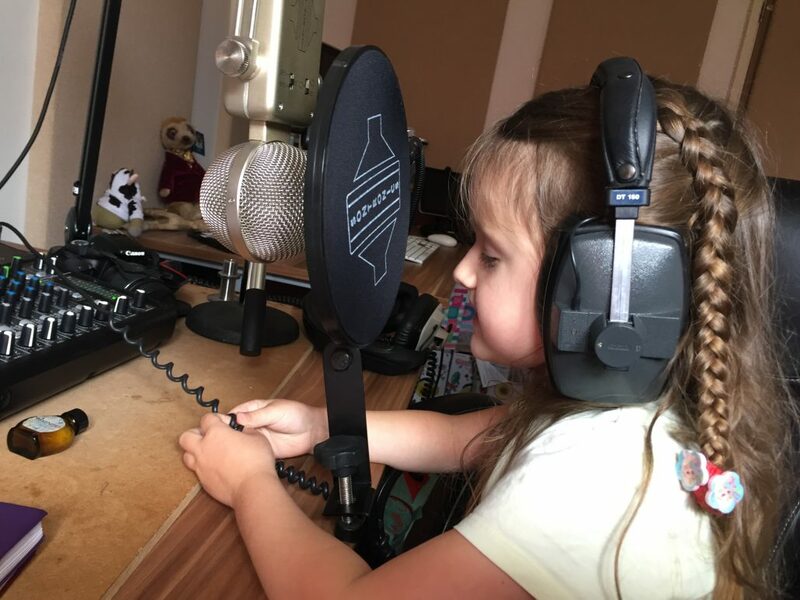 I had a few emails to send out and she happily popped on the headphones and ‘recorded some voiceover’. I love how completely at home she is in the studio, she chatted away quite naturally, sharing all her stories and thoughts, while I typed away. It was like listening to her soul. Her memories and thought, the things that she shared were just gorgeous and it was all about us being together. Not only that, Suki’s favourite part of our camping holiday was ‘her whole family sleeping in the same room together’. Sometimes they’re so gorgeous I could eat them all up. Don’t give up. They might want to be part of it, but the time isn’t right. They might just be really busy! 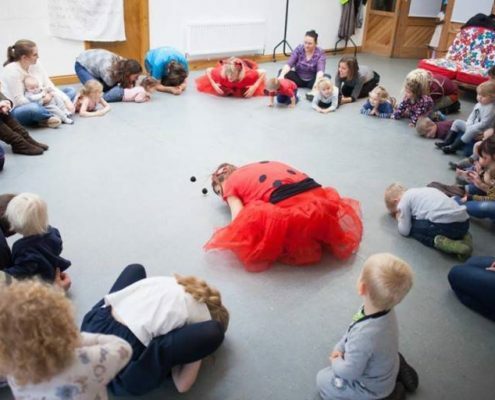 It was proven this summer, when Redmaids’ High began sponsoring Freelance Mum. They joined us for Brave, Bold & Bonkers in March, then went quiet. To be fair, they were busy merging with another school and it turns out that merging schools and building a new one, is demanding stuff! I could have gone quiet, but I gave them space, kept in touch and we got the green light this summer. Happy days for all of us. Without the events every month, it’s a good time to update images, hit September with a fresh line up and reflect that in posts. See, I told you Canva and I are getting on (I may live to regret writing that). When I say swim, I mean ‘not drown’ – but they are both quite adamant that neither of them want to wear armbands, which means taking a trip to the local swimming pool is even less relaxing. And it wasn’t exactly relaxing in the first place! So then, what’s your reflections on summer? What have you learnt, in life as a freelance mum, this August? If you’re chomping at the bit already – come and join us at Freelance Mum in September, we’d love to see you. Expert nutrition advice from the moment you decide to try for a baby. 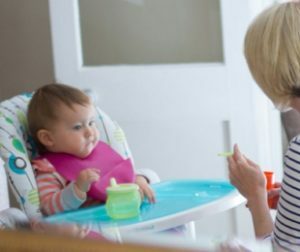 As a parent of two young children, meal times can be something of a struggle. In fact – eating & eating out is a completely different occasion to compared to that of 4 years ago! Still, I wouldn’t have it any other way, though it would make a nice change to get all the way through one meal without any one announcing ‘ yuck, I don’t like that’. Still, at least they’re eating something and we’ve come out the other side of a fussy eating phase, where the only food that was consumed seemed to be yellow. But it’s very easy to be all consumed (no puns intended) with just how much food our little ones eat, let alone think about ourselves. Yet take a step a back to a life before children, one of the most important things we can do on our journey to parenthood is prepare for the event. Looking after our diet can make a huge impact on conception, one of the most important things we can do is make sure our body is in the best physical condition – which is where Rosie Letts comes in. 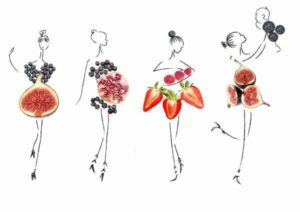 As a nutritional therapist, Rosie has always had a keen interest in diet and the role food plays on our health. It was only after having her own children, that she realized there was so much lacking in the main stream when it came to family advice. So armed with first hand experience and expert training, she launched Bump & Beyond Nutrition – assisting parents on their reproductive journey, from the moment they decide to conceive a child, to when they start for school. It’s an impressive field. After all, as Rosie explains, science of genetics has improved so dramatically we now know that what our Grandmother ate before and during their pregnancy, affects the way our DNA is expressed. Whilst our genes are malleable to an extent as adults, whilst you’re in the womb and a young child – you can do the most good at this time. Which is all well & good saying it, but when I cast my mind back to my pregnancies – a time I was desperately trying to stay healthy, if I so much as contemplated eating anything green & leafy I wanted to vomit. It turns out, it’s often the way the body is trying to tell us something – Rosie has had consultations with pregnant women who are addicted to licking walls, typically an extreme calcium deficiency. As for chocolate cravings – that’s often a lack of iron and zink. What I love about Rosie, is that she’s been there & done it – she understands the reality of being a parent & just how exhausting the journey can be. Take breastfeeding, for example, until you’ve been there it’s impossible to understand just how draining it can be – and it’s nothing to do with the umpteen night feeds! More having a little person plugged into you, can sap you of your very energy. It’s well known that a breastfeeding mum needs an extra 500 calories, but sadly that’s not all in cake! There’s so much iron & zinc in breast milk, it’s important to pay attention to getting extra good quality grains, meats, greens and vegetables. And from breastfeeding, there’s weaning – with it’s own set of worries, just how much do these little people need to eat & how often? It reassured me to learn that children don’t eat in the same way as adults, its more a case of healthy grazing. The most important things we can do is lead by good example – eat good food, in good formats and together as a family. In the time I spent talking to Rosie, it changed my mindset when it came to family meals. I’m quite sure plates aren’t about to be licked clean, but I feel on my way to healthy eating success! Rosie Letts is available for 1-2-1 consultations on pregnancy, conception & also runs private weaning classes. Like many parents, sleep is a big topic of conversation in our household – namely the lack of it. It would seem we have not one, but two children, who are both programmed to wake at 5.30am every morning. It’s not funny. No matter how many times we explain ‘you have to stay in bed until your clock goes yellow’, up they leap announcing it’s broken and they want to get up. That is, until we tried the Tots Up Reward Bus. Knowing I’m the mum of two pre schoolers, a good friend put me onto the bus (so to speak) and it’s spot on. A simple reward chart, that celebrates good behavior in a fab & fun way. A tried and tested concept, with a design that is something special. As the name suggest, the Tots Up Reward Bus, is a 3D magnetic bus – complete with it’s own bus stop of passengers. Every time the child does something that deserves a reward, they’re allowed to put a passenger on the bus – until all 10 passengers are on the bus. I don’t know who was more excited to put the first passenger on the bus – me or Jemima! It’s the brainchild of Sally Marks – a graphic designer and lecturer in graphic design. The concept was born 15 years ago when she was working for a spell with children on the autistic spectrum. Any good behavior was celebrated, while trying to ignore negative behavior. Not surprisingly reward charts played a large part in things & she quickly designed a basic paper bus, which allowed them to chart their success. The bus didn’t make an emergence again until several years later, when she was potty training her own son. She went back into her files and dug out the paper bus, stuck it to the fridge with the passengers, who in turn were stuck on to the bus with blu tack, every time a reward was needed. It was a friend who noticed it & asked if she could have one to use in her house, which sparked the idea – if other people liked the bus, was she onto something? So last year, Sally began a start-up course for businesses & the Tots Up Reward Bus was born. She’s worked closely with an educational psychologist who agreed the reason the bus is so successful, is because it’s so simple – it’s very easy for the child to understand what they are working for & what they have to do to get it. Speaking as a mum, it looks just striking too & is very engaging for children. Our bus gets several comments as visitors see it sitting on the kitchen worktop. For me, the proof is in the pudding. Not only is it a hit at home, but when Jemima & Suki had a sleepover at Nana & Bap Baps, the bus went with them. I received a very excited phone call from Jemima the next day, to tell me she’d got a passenger on the bus. The day there were all 10, was even more exciting! For many mums, when weaning begins, it opens up a whole new world of problems. From ‘will they ever eat from a spoon’ to ‘what if they choke’? It’s one of those more serious aspects that doesn’t dawn on you, until you’re watching your baby get to grips with eating. And it’s typically the point that lots of mums get in contact with Zoe Hunt from Mini First Aid. Mini First Aid was born in 2014, when mum Kate Ball, wanted to bring a range of classes to parents & grandparents, which were accessible to the whole family & specifically geared up for treating infants and young children. Of course, there are some elements that are universally the same – like how to treat a wound, but the nuts & bolts are aimed at dealing with tots. DragonBird Theatre – prepare for a land of make believe! When I was a new mum (all those many moons ago!) and grappling my way round the ‘baby circuit’, I was at a loss some days for what to do. Not because there was a lack of activities in Bristol, almost the complete opposite- I found myself overwhelmed with opportunities. 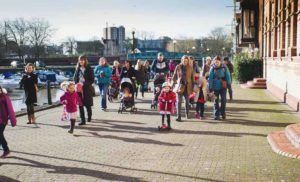 The trouble was, Jemima wasn’t a fan of the car, or pushchairs – so wherever we arrived, she was usually having a meltdown, we were both stressed, hot & sweaty & everything seemed to start on the back foot. Eventually, I decided it didn’t matter where we went, we were going to arrive in a pickle anyway, so we might as well make it something worth getting in a state over. I plumped for DragonBird Theatre Company, despite it being the other side of town for me, I was drawn to them as it was the first time I’d come across theatre for babies. I wasn’t let down. In true form, Jemima & I arrived in our usual ‘post meltdown car journey slightly stressed’ fashion, but it was worth the effort. I can still remember it now. 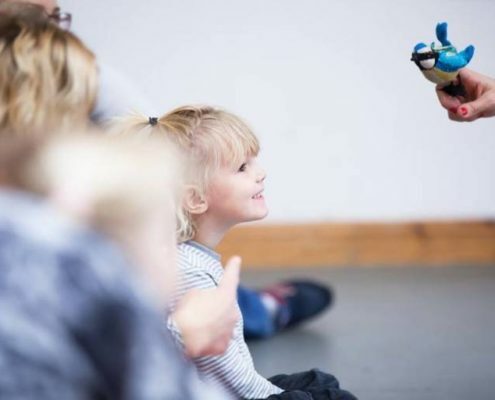 The session began with the performers (and brains behind DragonBird Theatre) Lotte Norgaard and Tilly Langdon, walking aroung the space & greeting every one with hand puppets Dragon & Bird, singing their signature ‘hello song’. You get used to ‘hello songs’ at groups, they’re usually nice enough, but sung with a slightly forced smile. This one was far more beautiful, almost folk like & soothing – in fact, almost 3 years on and I can still hum the tune. They then began a short performance of We’re Going on a Bear Hunt – everything larger than life & almost like a real life cartoon in front of your eyes. The children were spellbound. Completely caught up in the moment. The performance itself was only around 15 minutes, so no time for attention spans to wander, before the audience was invited to join the adventure. The room was divided into different areas so the children could experience ‘walking through the squelching mud’ or the ‘swishy swashy grass’, making the whole thing larger than life & completely interactive. 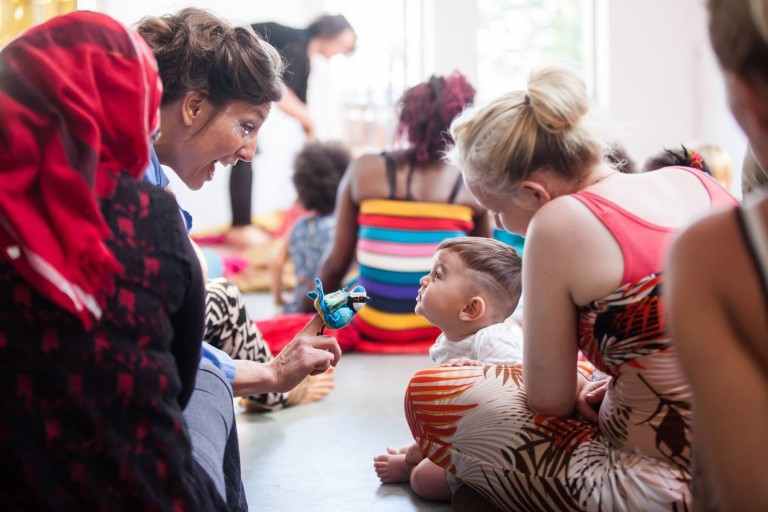 In terms of ‘the baby circuit’ that was some time ago, but the memory stays with me- it completely captivated all the children & gave them that first taste of theatre. Capturing their imagination, from the safety of their parents laps and showing them the power of make believe. I’ve followed DragonBird Theatre ever since and although I can’t make it on a regular basis, I love what they do. 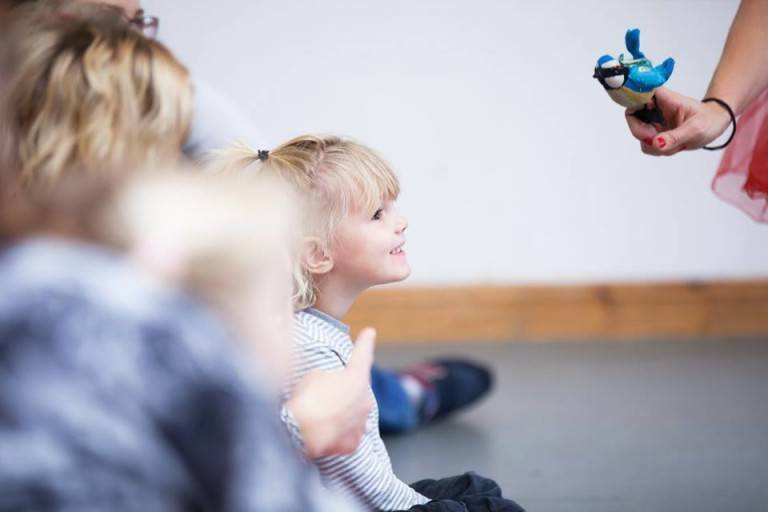 Both Lotte and Tilly were drama teachers, before they formed DragonBird Theatre and both felt compelled to work with early years. Both of them have complete for what they do & radiate a real warmth. Their philosophy, is it allows families time to enjoy playing together – to think about nothing else for those 45 minutes and just indulge in the experience. 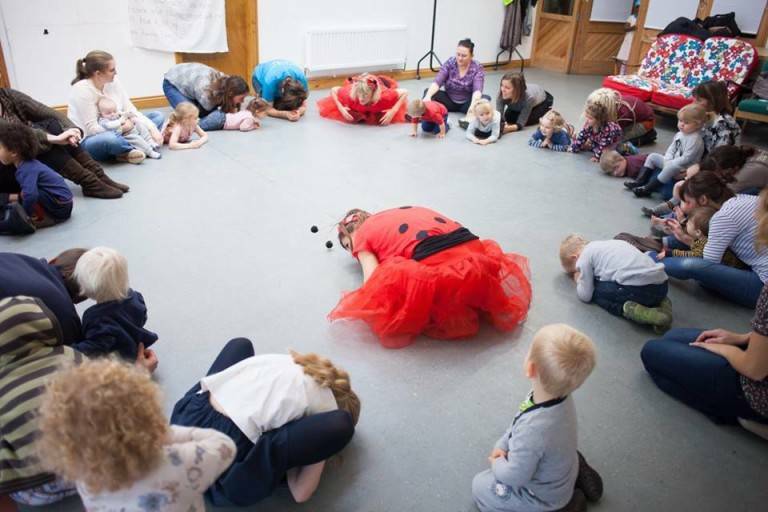 The sessions are all carefully structured for short attention spans, incorporating all the senses – so they’re engaging from the get-go. They’re aimed from birth – 5 and you can really see it working on every level. 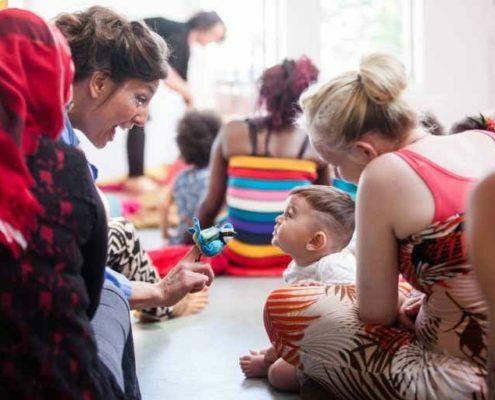 In fact, they don’t stop there – coming up they’re performing The Tempest as part of Shakespeare for Babies at The Egg. How’s that for ambitious? DragonBird Theatre Company was a little chink of sanity & escapism, in the midst of a very full on time for me. To watch little ones get caught up in the fun and spirit of adventure, is a joy for any parent. It’s part of their childhood I want them never to grow out of. As a mum of two young children, I know the rate of knots that we get through baby & toddler items. In fact, the smaller the child – the more ‘equipment’ you seem to need. Car seats, baby baths, cots, high chairs – they all come with a price tag & don’t even get me started on clothes. Every 3 months, it feels like a case of out with ‘not so old’ & in with the ‘newer’. But hey, these are growing children & their needs must. While there are some things you can make do with, there are other things, which are a necessity. I couldn’t even hazard a guess at how much we’ve splashed out in the last 3 years & I wouldn’t even say we’ve been decadent. It would seem I’m not alone in my thinking, in fact Eva Fernandes & Becky Gilbert have taken it one step further & together have co-founded Bristol’s first Baby Bank. The Baby Bank is pretty much as the name suggests, pre loved baby essentials for families in need. Or, in other words, a bank of baby items to see you through your baby’s first 12 months. As the founder of the popular baby shop Born, on the Gloucester Road & mum of two teenagers, Eva is no stranger to the baby world. She wondered how she could help families in the light of austerity measures and hit on the idea of a Baby Bank. A place where pre loved, but perfectly good items could be donated to families starting out. Realising she could be onto something, Eva got in touch with the Reused Network, who in turn tweeted out she was looking for storage space to get the scheme started. In the world of social media, meets real life, Becky Gilbert saw the tweet – then by chance bumped into Eva. As a mum of baby & toddler, Becky was keen to pass on her pre loved items to families that needed them. So although the pair of them were coming from slightly different angles, together they were a pair well met. That was in May and it’s incredible to see how between the two co-founders, how far the Baby Bank has come. Already they have nearly outgrown their first storage space, which was given to them by The Big Yellow Storage Space. It’s a clear reflection of how many parents are keen to help & are donating their old items. The question is – how do people qualify to receive items from the Baby Bank? That side of things relies on referrals from health visitors, children’s centres and other local professionals, who identify the families in need of support. In return, the Baby Bank provides them with a bank of items to get them started. It’s a simple idea, but the implementation of things is the most time consuming part! Just sorting through the donations is time consuming, but already the Baby Bank has attracted a team of 30 volunteers, all working in different capacities to keep the wheels in motion. The storage unit needs manning & keeping the word out relies on a social media team. You can tell by looking at their Facebook page alone, just how popular the scheme is proving. There are Cake & Donate days being held & grant applications being made. It’s early days – in fact you could say baby steps, but already they’re looking at gaining charitable status and opening other Baby Banks across the country.